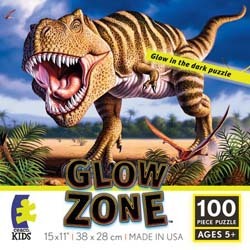 This week's jigsaw puzzle of the day invites you to step into the glow zone by assembling the T-Rex jigsaw puzzle. Your child can have fun both during daytime and by night with this 100 piece, 15 x 11 inches T-Rex jigsaw puzzle that glows in the dark. You can take advantage of this opportunity and introduce him into the lost world of the giants that once ruled the earth – the dinosaurs. To increase your child’s interest you can quiz him on facts about the dinosaur that slowly takes shape in front of his eyes. The T-Rex or Tyrannosaurus Rex, rex meaning "king" in Latin, was a bipedal carnivore and according to some experts, a scavenger. If you think that your child is too young for Jurassic Park, you might take it step by step and begin by introducing the characters before the actual action. And what character defines the lost world best? Its predator king, the T-Rex, of course. Tell your little ones all there is to know about this king of dinosaurs, and do not insist too much on the dangerous aspects of the encounter with such a beast. They might get scared and, with a big T-Rex that glows in the dark, that’s definitely not something that you want, especially during the night. Should you portray him as their protector though, they will feel a lot more assured and perhaps have the sweetest dreams of their lives.